Ariane 5 Flight 158 lifted off right on-schedule at 07:17:51 UTC on 2 March carrying with it the Rosetta spacecraft on the start of its 10 year journey to comet Churyumov-Gerasimenko. The solid boosters separated as expected at 07:20 UTC, followed 50 seconds later by the fairing. The first stage burn continued until 07:27 UTC and injected the EPS and Rosetta into a coast orbit. This was the first occasion that an Earth escape trajectory and a large delay until ignition of the upper stage has been flown by an Ariane 5 launch vehicle and the progress of the flight was monitored with mounting tension in the ESOC control centre. The ignition of the EPS occurred 107 minutes after launch at 09:14 and was monitored from a ground station in Hawaii until the vehicle moved out of contact. Contact was made again from the Galliot station in Kourou and at 09:32:36 Arianespace announced the separation of Rosetta. The achieved orbit proved to be near perfect. 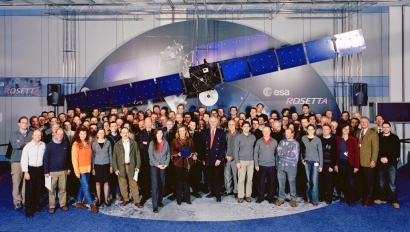 There was great joy and excitement in the ESOC control centre when the ESA Kourou ground station acquired the TM signal from Rosetta one minute later at 09:34. The spacecraft status was as expected and the automatic separation sequence was seen to be in progress. The venting and priming of the propulsion system was completed at 9:44. The initial spacecraft spin rate reduction and Sun acquisition phase proceeded very smoothly, and this was followed by the deployment of the two solar array panels, which was completed at 10:11. The separation sequence was completed with Sun reacquisition. The launch locks of the Lander Philae have been released successfully at the end of the first ground station pass. Philae now remains firmly attached to the spacecraft by the cruise latches until its release at the comet. 00:34 The High Gain Antenna was deployed, starting with firing the pyros of the launch locks. This was followed by 3 rotations, first in elevation, then in azimuth, and finally a combined azimuth and elevation movement, which brought the 2.2 m dish in the Earth pointing position. 09:34 The first trajectory correction manoeuvre was a test manoeuvre of 1 ms-1. The spacecraft was slewed to the required attitude in preparation for the 7 minutes burn. 11:49 Start of 7 minutes burn. 14:09 The attitude orbit control systems performed flawlessly throughout the manoeuvre and the spacecraft was back in its normal mode. Due to the excellent spacecraft performance and the good progress of planned activities, it is anticipated to advance some of the planned platform and payload commissioning. This completed a very successful first phase of the mission. The spacecraft has behaved very much as expected. Both the Rosetta spacecraft and ground segment continued to perform excellently.